When I first started my teaching blog in 2012, Blogger was the choice of the majority of TeachersPayTeachers sellers. After some years however, many make the move to Wordpress because of its functionality. Although Blogger remains limited in many respects, research on the internet will find workarounds for most things. I am happy with Blogger and have no plans to change any time soon! When I started to think seriously about growing and utilizing my email list, I decided to offer free teaching resources to my readers. The idea behind this is to offer a free download, stored in a VIP section or library, which can only be accessed in exchange for one’s email address. This strategy works really well in providing value to your readers and growing your list. Why do I need an email list for my business? Having a valuable email list is crucial because it's the best way to build a relationship with potential customers in an intimate way. The one thing that you have with an email list is control. With social media anything can happen to your account - policies can change, accounts can be shut down etc. However with an email list - you own it and you can do anything you want with it! You can keep your subscribers up-to-date with special events/sales/product launches/discounts etc. You can offer email courses - providing valuable content for free, which eventually leads readers to your special offer and hopefully, those all-important sales! Subscribe to a few email lists of your favorite sellers and see how creative they are with their content! This leads me to today’s tutorial – how to password protect a page on your blog. Although the page is ‘published’, the password is required to unlock the content. 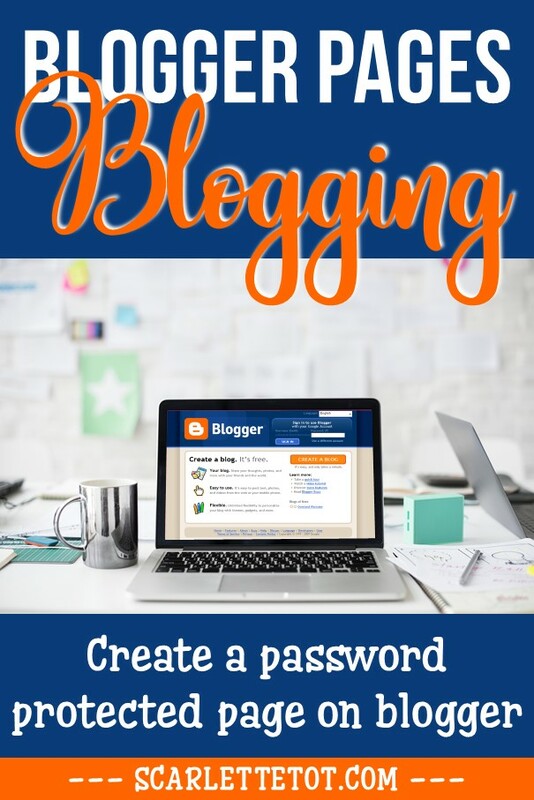 The password can be shared with your newsletter subscribers and they can visit regularly to access new content. Just follow the steps below to create a password protected page and spread the word to your customers to sign up to your library! 1. Go to your blogger dashboard and click on the PAGES section on the left hand side. 7 simple steps and you have a password protected page! Now get started on building a VIP Library with awesome content that your readers/potential customers can't help but subscribe to! To make this tutorial even simpler, if you don't have time right now, just click on the download button below and save in PDF format for a later date!